Sober Look claims that a “grexit” would result in converting at least half a trillion euros of external debt into drachms. 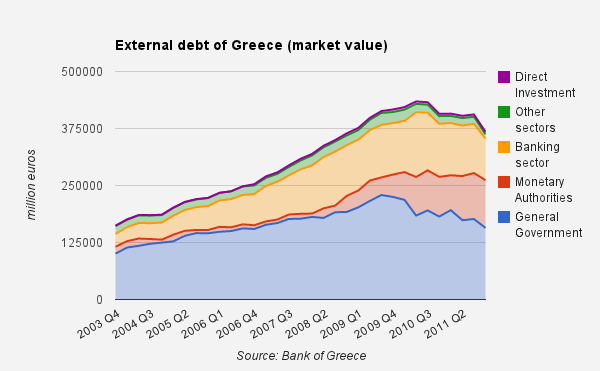 Of course, this means that half a trillion of debt would be partly written off with the devaluation of the new drachma. But Sober Look’s figures, I would say, are a bit misleading, since he assumes the bailout plans have been totally implemented. Which is not the case. 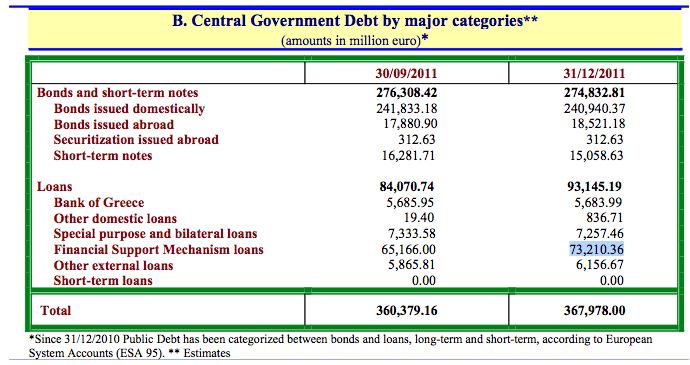 According to official figures (pdf) from the Greek Finance minister, at end-2011, only 73bn euros of public debt were related to the Financial support mechanism (maybe “bilateral loans” and “other external loans” are to be added ? I will assume yes later). So far as I understand, the difference between the plan bailout packages (110bn + 130bn) and the real figures below is due to the fact that all the payment tranches have not be unloaded. Taking into account that around 80bn of greek sovereign bonds were held domestically at end 2011, and leaving apart liabilities to the Bank of Greece, it leaves us with roughly 280bn euros of greek public debt held abroad. Direct investment and other sectors are almost insignificant (14.7 bn), while the banking sector represents 91 bn euros (again, at market value: foreign debtors may have already provisioned losses on their claims vis à vis greek banks). Lastly, the ECB’s claims through Target2 liabilities level at 104 bn euros. This, on top of 45bn of sovereign bonds (of which 4bn were redeemed yet) that are believed to be bought by the eurosystem’s central banks through its SMP program (at a discount price, so the ECB losses would be actually reduced to about 25-30bn). But also remember that the ECB holds a certain level of collateral assets parked by greek banks against liquidity provision. This collateral would theoretically remain on the ECB’s accounts. This makes roughly 220 bn euros for the international public sector, and 255 bn for the private sector. Frightening uh? Well, remember all these debts would not be automatically converted in drachms. For instance, claims from the eurosystem might be kept denominated in euros. 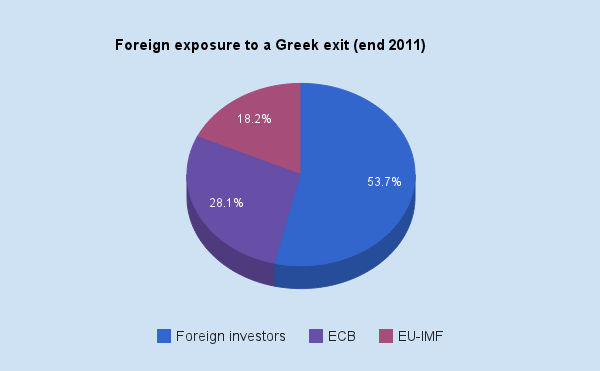 Also, let’s remember that the other eurozone economies have been benefitting from a huge capital flight for the last decade… At least 60bn of deposits have been moved abroad by Greek people, in an attempt to save their money in case of an exit. If it were to happen, this money would flow back in Greece. A good policy for Greece could be to let it happen, while applying tax to a certain level these capital moves, thus collecting a large sum of foreign currencies to repay these foreign currency denominated debts. Again, remember these are end-2011 figures. They would need to be updated taking into account the debt restructuring that occurred in march 2012 (PSI). I’ll try to do it to have a more accurate picture of the situation right now. Meanwhile, can someone tell me if I am wrong somewhere?